To round out the picture you appear to be, political preference aside, an egalitarian with primarily strong opinions. I must admit, the whole thing is written very much like an opinion piece and with no context for the numbers its basically useless. I am less radical, more tender, and just as socialist as Dan. Somehow that result doesn’t surprise me. I’m a libertarian with several strong opinions. I’ll have to tell my wife. Dan said, “I’ll simply state that I can’t be a squish if my policy heroes are people like Barry Goldwater, Ronald Reagan, and Margaret Thatcher. My baseball heroes are Mike Schmidt and Brooks Robinson: that doesn’t make me a home-run hitting Hoover at third base, now does it? I got 77 for radicalism, 34 for tenderness and 0 for socialism. Dan, what IS the matter with you getting 18? By the way, one serious flaw with the test: it kept asking what “we” should do about X without specifying who “we” are. I put that I think “we” should spend more on international aid (and still got 0 for socialism, by the way). I meant things like individuals buying goats for families in Africa or sponsoring girls in India, as I do. I didn’t mean government to government aid. 102…………. does this mean I have to wear an aluminum foil hat…………..? 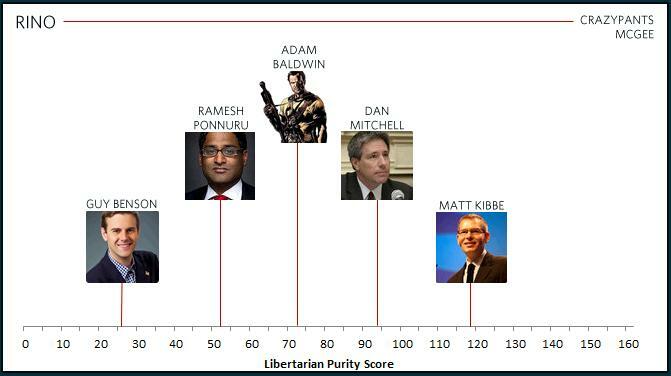 I am described as a “progressive libertarian” which is actually right, for the wrong reasons. With a 50 on the tenderness scale, I wonder why I didn’t do better with the “chicks” when I was in play. Yeah I just don’t understand these numbers for Radicalism and Tenderness but I am happy with the 0 for Socialism. With a purity score of only 93, I still came out more radical, less socialist and more tender. Unbelievable! I was more radical, less socialist and slightly less tender than you. This has to be wrong.